Inscription. Built, 1882-1883, to replace the previous Capitol, which had burned in 1881. Until the building was completed, the orphaned Texas government conducted business in the county courthouse and jail across Congress avenue. The three-story brick building “third Texas Capitol in Austin” was used five years. During this time it witnessed the passage of strong legislation to aid education and to halt fence-cutting, which, in 1883, had exploded into a range war. Governors John Ireland (1883-1887) and Sul Ross (1887-1891) both served in this building. In 1883, the University of Texas held classes here for its 218 students until campus facilities were completed. On another occasion, cattle baron Charles Goodnight loaded $100,000 in cash in a wheel barrow and had it hauled to the Capitol to force settlement of a land dispute, but officials refused his offer. 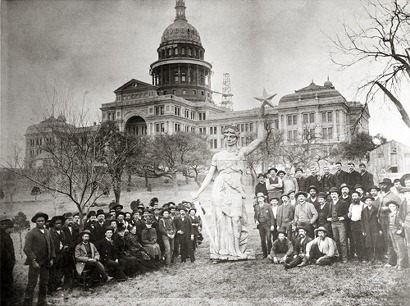 After the present Capitol was finished, 1888, this structure was used as home of Austin High School. Studios for music teachers, and for various offices. 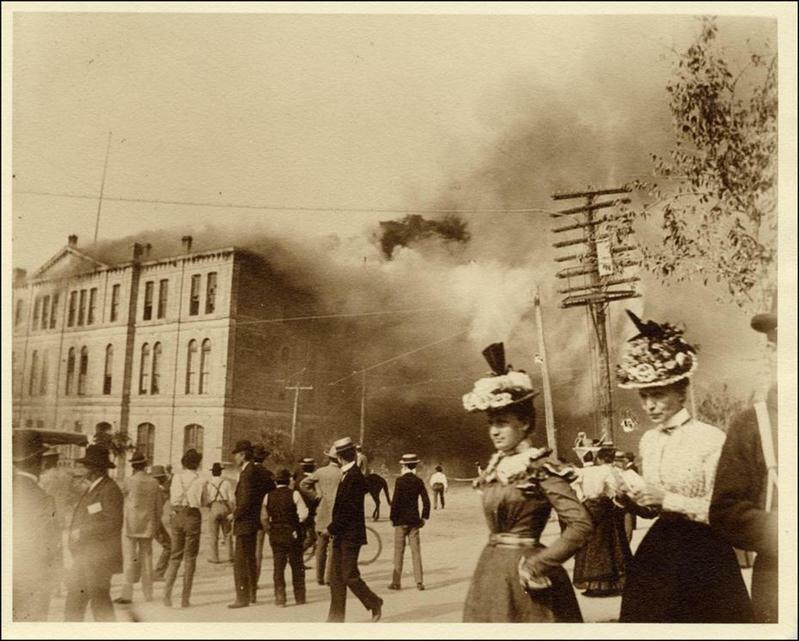 When it burned, Sept, 30, 1899, curious spectators sat on the fence around the new Capitol to watch volunteer firemen, hampered by low water pressure fight the blaze. The old building was razed soon after and the bricks were used in structures throughout Austin. Congress Avenue was designed to be Austin’s most prominent street. 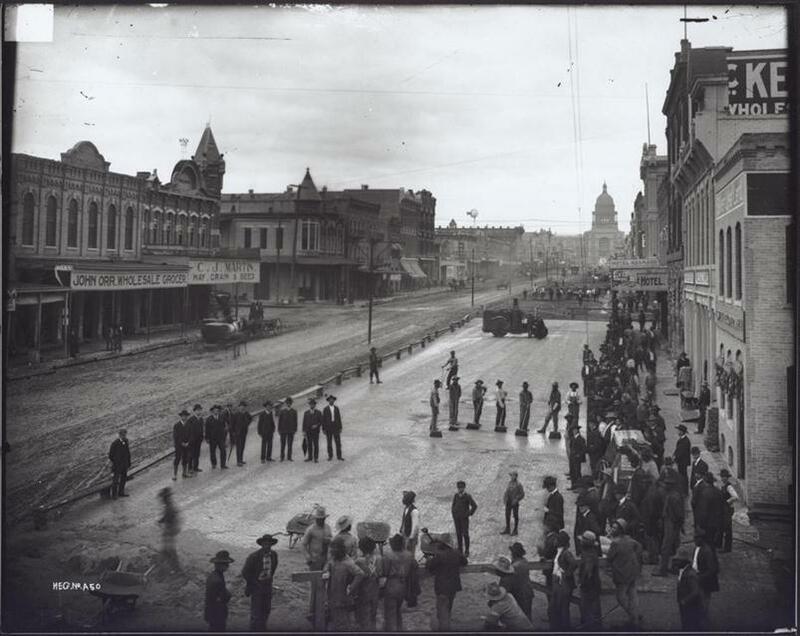 Early structures along Congress Avenue included government buildings, hotels, saloons, retail stores and restaurants. By the late 1840’s “The Avenue” formed a well-established business district. The mid 1870’s introduced gaslight illumination and mule-driven streetcars. The original dirt street was bricked in 1910. Trolley cars operated on Congress Avenue until 1940. In 1836, five sites served as temporary capitals of Texas (Washington-on-the-Brazos, Harrisburg, Galveston, Velasco and Columbia) before President Sam Houston moved the capital to Houston in 1837. 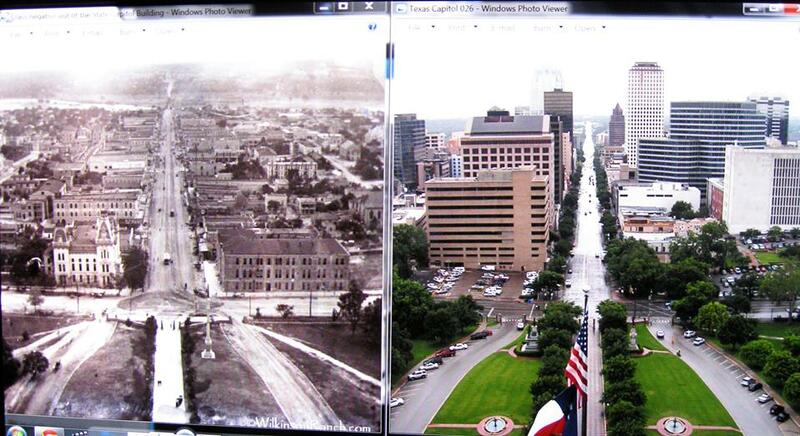 In 1839, the capital was moved to the new town of Austin by the next president, Mirabeau B. Lamar. The Texas State Capitol is located in Austin, Texas, and is the fourth building to be the house of Texas state government in Austin. It houses the chambers of the Texas Legislature and the office of the governor of Texas. It was originally designed in 1881 by architect Elijah E. Myers, and was constructed from 1882 to 1888 under the direction of civil engineer Reuben Lindsay Walker. A $75 million underground extension was completed in 1993. The building was added to the National Register of Historic Places in 1970 and recognized as a National Historic Landmark in 1986. The Texas State Capitol building is 308 ft. (94 m) tall. Construction of the Italian Renaissance Revival style capitol was funded by an article of the state constitution, adopted February 15, 1876, which authorized the sale of public lands for the purpose. In one of the largest barter transactions of recorded history, the builders of the capitol were paid with over three-million acres (12,000 km) of public land in the “Panhandle” region of Texas; this tract later became the largest cattle ranch in the world, the XIT Ranch. The value of the land, combined with expenses, added to a total cost of $3.7 million for the original building. It was constructed largely by convicts or migrant workers, as many as a thousand at a time. The building has been renovated several times, with central air conditioning installed in 1955 and the most recent refurbishments completed in 1997. The cornerstone for the building was laid on March 2, 1885, Texas Independence Day, and the completed building was opened to the public on April 21, 1888, San Jacinto Day. The building was originally planned to be constructed entirely of limestone from Oatmanville (present-day Oak Hill), about ten miles (16 km) to the southwest. However, the limestone was found to have a high iron content after it began to discolor. Learning of the problem, the owners of Granite Mountain near Marble Falls offered to donate to the state, free of charge, the necessary amount of pink granite as an alternative. While the building is mostly built of the Oak Hill limestone, most of it is hidden behind the walls and on the foundations. 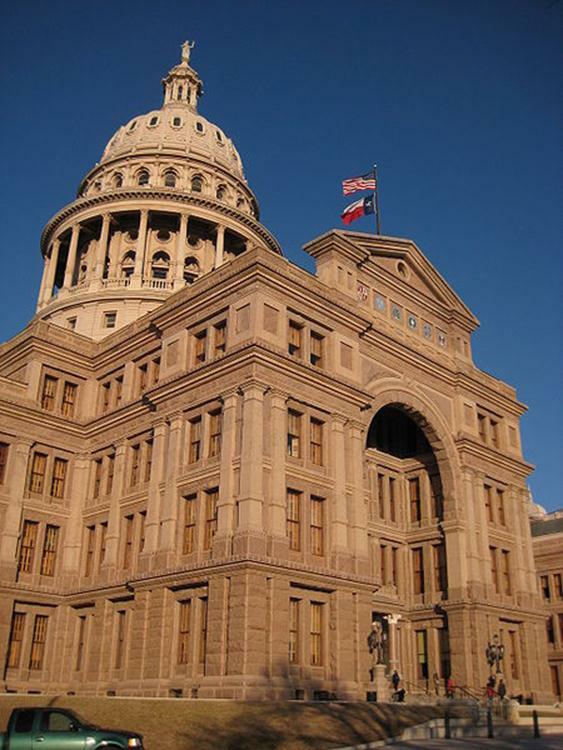 Pink granite was subsequently used for many state government buildings in the Austin area. In 1993, the $75 million underground Capitol Extension was completed to the north, doubling the square footage available to Capitol occupants and providing much improved functionality. In 1995, a comprehensive interior and exterior restoration of the original building was completed at a cost of approximately $98 million. Finally, in 1997, the park-like grounds surrounding the Capitol were given $8 million renovation and restoration. Subsequently, to preserve the facade and historic plaza, the new Capitol Extension was built as a four-story underground structure, completed in 1993. Though the extension encompasses 667,000 square feet (62,000 m2), nearly twice the floor space of the original building, there is little evidence of such a large structure at ground level, except for extensive skylights camouflaged as planter rows. Located four blocks south of the University of Texas, the Texas Capitol building is surrounded by 22 acres of grounds and monuments. There are 17 monuments that surround the Texas Capitol. William Munro Johnson, civil engineer, was hired in 1888 to improve the appearance of the grounds. By the time the first monument, commemorating the Heroes of the Alamo, was installed in 1891, the major components of Johnson’s plan were in place. These included a “Great Walk” of black and white diamond-patterned pavement shaded by trees. The four oldest monuments are the Heroes of the Alamo, Volunteer Firemen, Confederate Soldiers and Terry’s Texas Rangers, and flank the tree-lined Great Walk. A granite monument of the Ten Commandments on the grounds of the Texas State Capitol was the topic of a 2005 U.S. Supreme Court case, Van Orden v. Perry, in which the display was challenged as unconstitutional. In late June 2005, the Court ruled that the display was not unconstitutional. The Landmark of Texas Architecture of Jasper Newton Preston, by Bob Brinkman, Southwestern Historical Quarterly 110.1 (2006) vii, 1-37.